A portrait of FSU Art Assistant Professor Dan Torop is in Jason Schmidt’s recently published book Artists II (Steidl, 2015). Accompanying the image is a brief text by Torop describing his working practice. 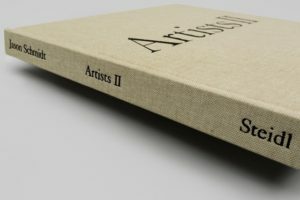 Artists II is the second volume of Jason Schmidt’s ongoing photographic documentation of today’s most significant artists. From young to old creative forces, emerging to career-peaking, world-famous or as yet unknown, Schmidt’s images, captured over a period of twelve years, are an incisive look into the art world of today. Artists II depicts 166 artists, including John Baldessari, Ai Weiwei, Glenn Ligon and Cindy Sherman, in their studios or work environments, showing the practitioners in their most intimate moments—in the process of creation. A revealing text by each artist accompanies his or her portrait; some are literal descriptions of the encounter, others are poetic or enigmatic. Situated between portraiture and landscape, Schmidt’s photographs show art and artist in constant transformation, and form a comprehensive archive of contemporary artistic practice.